This past Sunday, January 27, 2013, I faced and conquered one of my biggest goals to date. 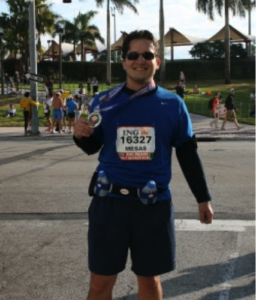 I ran my first full marathon (2013 ING Miami Marathon). This was a big goal for me to finally run the 26.2 miles of the marathon. 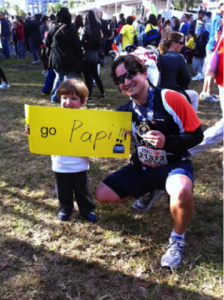 My dream began over 4 years ago when I first started running. Since I began running, I’ve run 10 half marathons and other races (5K, 10K, mud runs), but the goal of running a full marathon always seemed unattainable. In my mind, I kept telling myself it a was a goal I could pursue later on in life when my kids were older and I had more time to invest in training. I had all these conditions that needed to be met in order for me to commit, or at least that’s what I was telling myself. I insisted that there was no need to run that far, to prove what? I put up all kinds of excuses and reasons of why I couldn’t or shouldn’t pursue it, yet I was never satisfied with the BS I was feeding myself. Why? Because deep down I wanted to reach that mountaintop, I wanted to do what most runners dream of doing at least once in their lives. 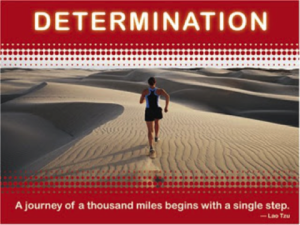 I did want to test myself to see if I had the dedication, determination, strength, persistence, patience and endurance to pursue a goal that for so long seemed elusive to me. 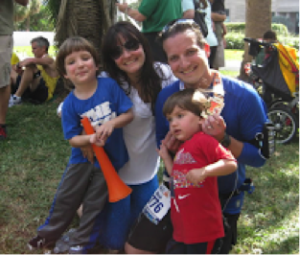 My love for running started back in 2008, soon after the birth of my first son, I decided to take up running as a form of exercise to help get me back in shape. The weird phenomenon that tends to happen to men when their wives get pregnant, actually happened to me. I had ballooned to 40 lbs over my ideal weight. I don’t know if it was her or me getting all the cravings late a night. What I do know is that I was overweight and not proud of how I had let myself go. I decided then and there that I would commit to doing something about it. I looked at my son and knew this little guy was going to be my driving force, my inspiration to achieve all my goals. Right away I knew I wanted to be the dad that would be active, one that could run with him, a dad that could go out and play for hours with him. A dad with no excuses! What I did was compare myself and my results to what I did yesterday and the week before. I was trying to be better than I was last week or last year. I wasn’t focused on beating extreme athletes in a fitness competition. 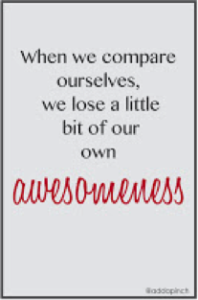 My goals revolved around improving myself compared to myself, not to anyone else. The key is to keep track of your progress, take notes of your results so that you have something to compare to. You can’t get better if you don’t know how well you did before. This serves two purposes; the obvious one is to help you measure your improvement, or lack thereof, over time. The second and critical purpose it serves is to motivate you to recommit to your goals. Once you’ve seen progress and results, this will inspire you to continue forward and stay committed. Obviously, lack of results can do just the opposite. You have to put in the work in life, no one said this would be a piece of cake. I ran several half marathons since the first one back in 2009 and last Spring (2012) I decided it was finally time to commit to the 6+ months of required training to properly run the full marathon. What initially began as a goal, quickly became somewhat of a spiritual journey for me. There is something about setting tough goals and focusing your energy on reaching them; that changes you as a person. You begin to find out what you are truly made of, you discover the type of person you truly are when no one but yourself is watching. If you are aware and present, you will catch yourself when you come up with your old habitual excuses or reasons of why you can’t do this or that. 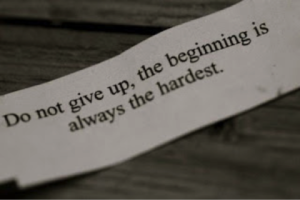 Through the hundreds of miles of training, the thought of quitting would creep in many times. 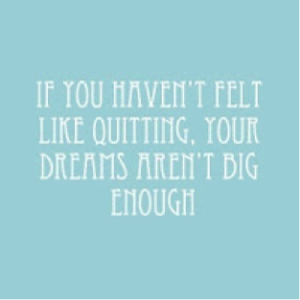 If you aren’t doubting yourself, then maybe your dreams aren’t big enough. It’s normal to have doubts and fear in your pursuit to a achieve a big goal. 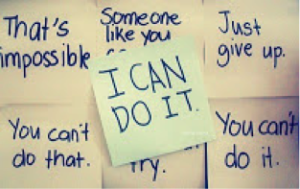 You just to have to acknowledge these thoughts for what they are and continue to push forward. For me the doubt and fear truly ramped up the weeks leading up to the race. I was starting to feel pains from my training which, in my head, threatened to derail the last six months of training and my chances of racing. I was losing confidence in my ability to follow through with my goal. I share this because we all experience these fears and self-doubts at one time or another. I tried all kinds of self-motivation techniques to pump myself up and get my mind out of the negative thoughts. What got me out of the doubt swirl was my wife’s encouragement and confidence that I could do this. She kept reminding me that I had trained hard and that my body was ready for the race, I just needed to rest. Then others began to repeat the same to me. Sometimes people see things we are not able to see ourselves when we are in the middle of the worry fog. Listen to these people, they will provide you that extra push of encouragement you need to follow through. I was able to cross the finish line this past Sunday to complete my first full marathon. I was blessed to have family and my closest friends there to cheer me on. It was a moment I will always remember. While completing the race gave me a great sense of accomplishment, I feel the most personal growth I attained was through the journey of achieving it. The journey during the tough times of training, I identified my weaknesses but I also uncovered some untapped strengths I never knew I possessed. It is in the pursuit of the goal that we truly grow, regardless of whether the goal is achieved or not. The mere act of setting, committing and pursuing a worthy goal sets into motion an energy that will transform you into the person required to achieve it.